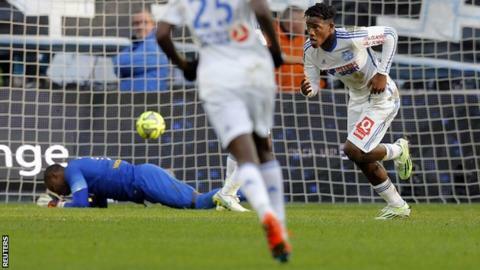 Michy Batshuayi scored the winner to help Marseille beat Lille and move two points clear at the top of Ligue 1. Paris St-Germain only managed a 0-0 draw against Montpellier on Saturday and Marseille capitalised to move three points clear of their rivals. Nolan Roux's own goal gave them the lead against Lille and, despite an Idrissa Gueye equaliser, Batshuayi sent in a half-volley for the winner. Lyon won 5-0 at Bordeaux to leapfrog PSG and move into second place. Ligue 1 top scorer Alexandre Lacazette scored twice for Lyon as he took his tally to 17 for the season. Bordeaux were reduced to 10 men after Nicolas Pallois was sent off in the 65th minute, while Corentin Tolisso, Nabil Fekir, Jordan Ferri were Lyon's other scorers. Match ends, Marseille 2, Lille 1. Second Half ends, Marseille 2, Lille 1. Soualiho Meité (Lille) wins a free kick in the attacking half. Foul by André Ayew (Marseille). Ronny Rodelin (Lille) wins a free kick in the defensive half. Brice Dja Djédjé (Marseille) wins a free kick in the defensive half. Foul by Divock Origi (Lille). Rio Mavuba (Lille) wins a free kick in the defensive half. Offside, Lille. Ronny Rodelin tries a through ball, but Divock Origi is caught offside. Substitution, Lille. Ronny Rodelin replaces Ryan Mendes. Substitution, Marseille. Jérémy Morel replaces Florian Thauvin. Foul by Nicolas N'Koulou (Marseille). Djibril Sidibe (Lille) wins a free kick in the attacking half. Djibril Sidibe (Lille) has gone down, but that's a dive. Delay in match Idrissa Gueye (Lille) because of an injury. Jacques-Alaixys Romao (Marseille) is shown the yellow card for a bad foul. Foul by Jacques-Alaixys Romao (Marseille). Idrissa Gueye (Lille) wins a free kick in the attacking half. Substitution, Marseille. Jacques-Alaixys Romao replaces Mario Lemina. Attempt missed. Michael Frey (Lille) right footed shot from outside the box is too high. Attempt missed. Divock Origi (Lille) right footed shot from outside the box misses to the left. Assisted by Rio Mavuba. Substitution, Lille. Soualiho Meité replaces Florent Balmont. Foul by Brice Dja Djédjé (Marseille). Idrissa Gueye (Lille) wins a free kick in the defensive half. Attempt missed. Ryan Mendes (Lille) header from very close range is too high. Assisted by Divock Origi with a cross. Goal! Marseille 2, Lille 1. Michy Batshuayi (Marseille) right footed shot from the centre of the box to the top left corner. Assisted by Florian Thauvin. Attempt blocked. Ryan Mendes (Lille) right footed shot from the right side of the box is blocked. Assisted by Djibril Sidibe. Attempt missed. Brice Dja Djédjé (Marseille) right footed shot from the right side of the box is close, but misses to the right. Assisted by Florian Thauvin. Attempt missed. Idrissa Gueye (Lille) left footed shot from outside the box is too high. Assisted by Michael Frey. Michael Frey (Lille) is shown the yellow card for a bad foul. Foul by Michael Frey (Lille). Goal! Marseille 1, Lille 1. Idrissa Gueye (Lille) left footed shot from outside the box to the bottom right corner. Assisted by Djibril Sidibe. André-Pierre Gignac (Marseille) wins a free kick in the defensive half. Foul by Simon Kjaer (Lille).